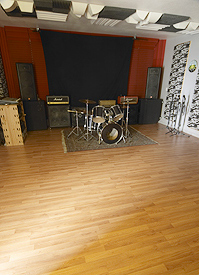 When not in use for recording sessions, our 18' x 23' tracking room is available for hourly rental as a rehearsal studio. We have no set opening or closing hours, so you can request rehearsal time for any hours of day or night, 7 days a week, and if the exact hours you request are not available, we'll let you know the next available time. There is no minimum booking length, but we recommend booking at least two hours. Our recording studio live room, where rehearsals take place, is the only music room in the building. Each band booking the room has the facility to themselves for the duration, rather than working amidst the noise and crowding of multiple bands playing all at once. There is a large, comfortable couch in the room, and a full-size wall mirror at one end so you can either watch yourself practice, or pull the curtain to cover the mirror.. Our private gated parking lot is directly outside the studio entry door, for easy load-in. The room has full air-conditioning and heating. Use of the rehearsal space includes our 3000-watt PA system with up to three vocal stage mics. Selected guitar and bass amps, as well as a small Tama drum kit, are available for use at no charge. Drummers must always bring their own snare drum, cymbals, and kick pedal. Our Baldwin 6000 Concert Vertical piano also makes its home in this room, and is available for use during rehearsals at no extra charge. Rehearsal studio bookings follow the same process as recording studio session bookings: you'll need to send the information described here. Studio terms and policies are listed here. For first-time rental requests, you'll need to provide your information and request at least 5-7 business days in advance, and payment will need to be completed by appointment or by mail at least 48 hours in advance to confirm. Same-day payment applies for second-time bookings onward, and all reservations need to be confirmed at least 48 hours in advance, otherwise higher short-notice reservation rates apply.